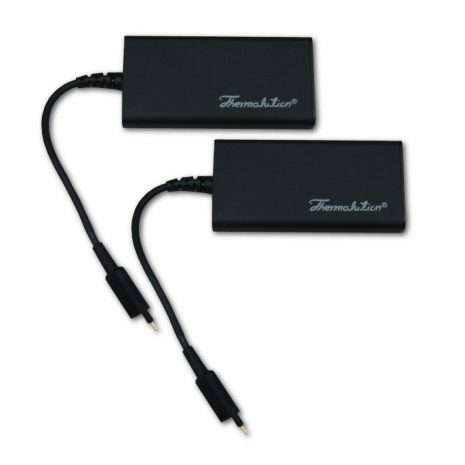 Two Extra/Replacement Batteries for Thermalution Surf Series (15M) or Thermalution Compact Dive Series (70M). The spare batteries have worked as advertised. Nice to have extras for a 2 tank dive. My only concern is with the connectors. I have used my vest at least once a week since mid may and with out any problems but, I am concerned with the longevity of the connection pins after repeated use and am concerned that they will break off. I would liked to have seen them a little more robust. As far as my 70M vest, It does add warmth as advertised but, is definitely not a cure all in 45 degree water, even under a 7 mil. Is it possible to have heating elements on the front side also? My biggest complaint about the vest is the color indicators on the controller. The orange and the red are too close in shade. You really have to focus as you go through the selections. It would have been better if the medium setting was yellow or perhaps blue. Overall, I am still glad I bought it. I didn't realize that you didn't offer dealer price on these batteries before we sold them. We will have to think twice before offering them in the future. So far so good. Kristi loved the fit and the warm suit in cold water. Love the shirt! Worth every penny! And now that I have an extra set of batteries, I will always be toasty underwater! Own the 70m system with spare backup batteries. I am 68 years old and tend to get COLD even in 80+ degree temperatures after long exposures. I still push the limits on depth! Thanks to this system I can totally enjoy my long dives and extended hang times. The ease of charging, hooking up and unhooking the batteries is a dream come true. It looks good and feels even better. PS I even used it at a Penn State Football game with wind chill at below zero. Wish I had my new extra batteries. You probably won't need the extra batteries, but just in case you are out diving and don't have a chance to recharge them. Thanks Matt for all of your help and your follow through! Suit and batteries arrived in time. Too expensive? Yes. But so is the shirt the batteries go with. Worth it to have my wife diving with me? ABSOLUTELY. Core warmers didn't work, Lavacore didn't work, fleece didn't work, only the heated shirt has made my wife comfortable on dives and surface intervals. On a liveaboard we recharge the batteries between the dives. On a 2 or 3 tank dive boat, my wife gets too cold once the batteries die. Now she can stretch her heating, and comfort, out for the duration. The extra batteries are the same as the well made originals. Did I wait for the batteries to go on sale? You bet I did!